We’ve had some FUN, April Busy Boxes! Everything is colorful this time of year and G is all about colors so I tried to do some color themed activities. I taped a color sheet into the bottom of the box (I made this one on the computer) and filled the busy box with tiny, colorful objects. 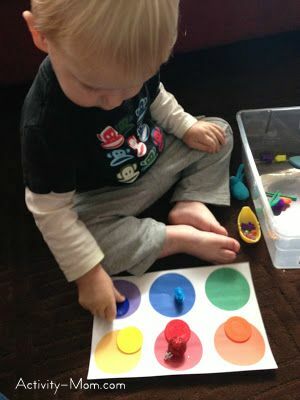 He has to sort the colors onto the circles. 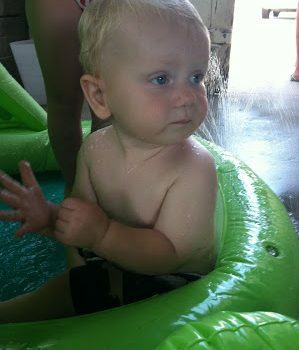 I will say that this one keeps him VERY occupied and I add/delete objects throughout the month. 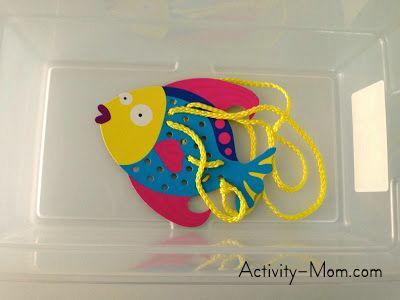 This little fishy lacing card came from the dollar section at Michaels and he loves to push and pull the string through! Oh G loves this book! 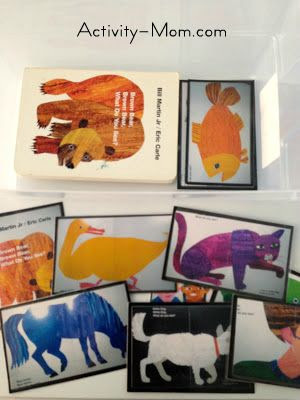 I put the board book in the busy box and then I got creative. I took a photo (though in retrospect, you could probably Google around and FIND these images!) of each page, printed, and laminated. After we read the book (or sometimes, AS we read the book), we grab a card and put them in order! 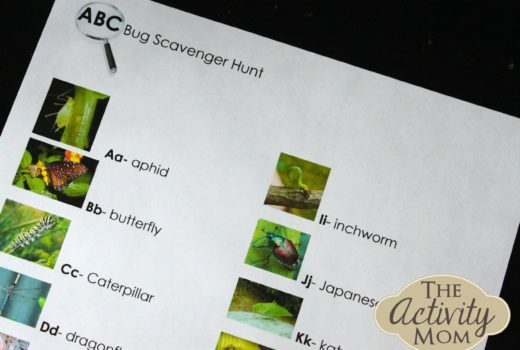 It’s also a great learning activity to ask him to HAND me a specific color or animal. While I had my laminator out, I grabbed some old family photos and ran them through the machine. Then, I cut them up! Mostly I made puzzles with two pieces, but some do have three pieces. G has to put the pieces together to make a picture! This was a little overwhelming at first, so I would only give him the pieces needed to make ONE picture and help him manipulate them to make a picture. Look at my happy guy, learning and playing! I often sit and nurse Baby G (now 3 weeks old) while he keeps himself busy and happy! 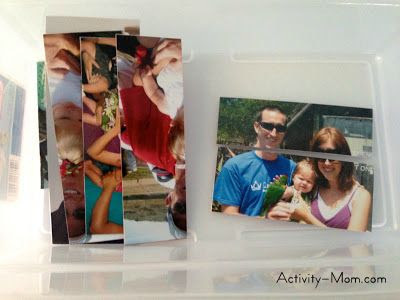 Have you made any busy boxes lately? 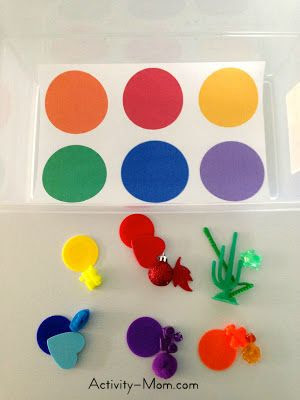 Hi, I know it’s been several years since this post, but I was wondering if you could share a link to the circular manipulatives (I know they’re not poker chips) you are using? Those circle manipulatives are from Oriental Trading Company. Search plastic chips (usually in the math section).